GCSE students in England, Wales and Northern Ireland have been receiving their results today. The results show that 68.8% of entries scored A*-C, up from 68.1% last summer, although there was a marked fall in English GCSE grades. 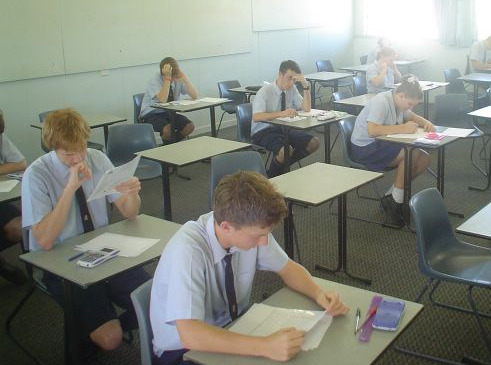 Students sitting their GCSE Maths exam. There have been warnings of volatility in this set of results following an overhaul of the exam system. The most significant impact on this year's results has been the big fall in students taking their GCSEs a year early. Schools have been discouraged from such multiple entries following changes in the way school league tables are compiled. Fewer fourth years taking maths GCSE meant there was a sharp improvement in maths results: the percentage achieving A* to C grades rose by 4.8 percentage points to 62.4%. The overall pass rate was 98.5%, down 0.3 percentage points. 6.7% of entries were awarded an A* grade. Girls are still doing better than boys at GCSE, with 73.1% of girls' entries achieving A* to C compared with 64.3% for boys. In England, but not in Wales or Northern Ireland, this is the first year of results following moves towards exams at the end of two years, rather than including coursework and modular units. The results for GCSE English seem to have been most affected by this change, with the number of A*-C grades down 1.9% to 61.7%. In Wales and Northern Ireland, these changes were not introduced and the three regional sets of GCSE exams are now beginning to diverge in various ways, including the subjects being taken by students. While the government are defending the changes being made, Chris Keates of the NASUWT teaching union said this year's students had to "cope with a raft of rushed through and ill-conceived changes to the qualifications system and so today's results are especially commendable". The National Union of Teachers' leader Christine Blower said that the headline figures "mask underlying issues which will only become clear over time". Have you had your GCSE results today, or are you teaching GCSEs? How did your school fare following changes to the structure of GCSEs this year? Let us know at info@mathsbank.co.uk .